In the year 1999, a house was purchased at Enikepadu, Vijayawada with the intention of setting up a Provincial House there. Meanwhile, since a study house was of urgent need to recruit and form candidates from Andhra Pradesh and also to accommodate the +2 students in Vijayawada, it was decided to convert it into a study house after some modification, and to shift the Provincial Headquarters to Mysore. Fr. Jaimy Moonjely along with 12 students stayed in that house from 28th of September 1999 while the modification was going on. The candidates here attended the +2 (Pre-university) studies in the Loyola College in Vijayawada. 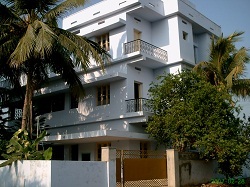 The house was blessed and inaugurated on November28, 1999 by His Excellency Rt. Rev. Dr. Marampudi Joji, the Bishop of Vijayawada. Later South Indian Province has organized its social services under OASIS, a registered NGO. The OASIS administrative headquarters located in the former seminary house in the town of Enikepadu. Father Thomas Kottukappilly, C.M. the first director of OASIS established the society in 2001 and he was at the helm of affairs of the society for two years. Father Sebastian Anthikad the second director of the OASIS took charge on June 15, 2003.